Tan Kim Ho was detained by Malaysia's cops and handed over to the Singapore authorities. Former City Harvest Church (CHC) leader Chew Eng Han had tried to escape by boat to Malaysia. 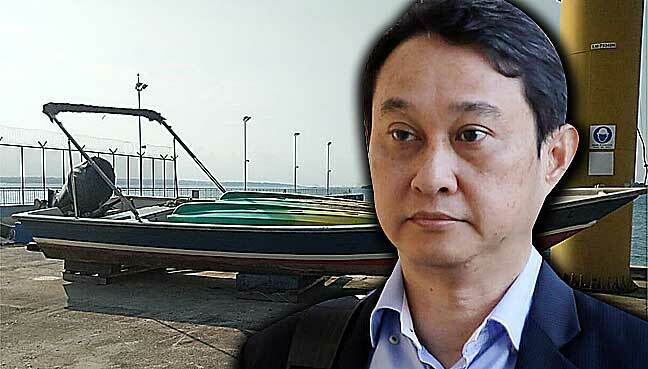 PETALING JAYA: A 42-year-old Malaysian man has been handed over to Singapore police after he was alleged to have helped a convicted church leaderâs bid to escape the republic by boat. Tan Kim Ho was believed to have been approached by another Malaysian, Khoo Kea Leng, to help former City Harvest Church (CHC) leader Chew Eng Han, 57, escape, Channel News Asia reported. Chew, however, was arrested on Feb 21, a day before he was due to start serving his 40-month jail term for his part in the largest misuse of charitable funds in Singaporeâs history. Kim Ho was arrested by Malaysian poli ce and handed over to Singapore on April 14. He will be charged in court on April 16.
âOnce again, I would like to thank the Malaysian police for their swift efforts in locating and arresting the suspect. âThis arrest highlights the close collaboration and strong relationship between the Singapore and Malaysian authorities,â commander of the Singapore police coast guard SAC Hsu Sin Yun was quoted as saying. Another man, 53-year-old Tan Poh Teck, who was piloting the boat, was also arrested after their boat was intercepted by police in the sea off Pulau Ubin. They were headed for Malaysia. According to the Singapore police coastguard, Chew was found with S$5,000 (RM14,800) in cash and some fishing equipment when he was nabbed together with Poh Teck just before 9am. Chew and the boatman had reportedly told the police that they had just been out fishing. Police later arrested Chewâs brother for allegedly abetting in the escape atte mpt. Chew was one of six City Harvest Church leaders, who in 2015 were convicted of using S$24 million from a church building fund to help the wife of principal leader, Kong Hee, Sun Ho, become a recording artiste. They were also found guilty of misappropriating another S$26 million from the church to cover their tracks with a complex web of financial transactions. Chew, who was the church boardâs vice-president and treasurer, had been sentenced to six years in jail, while the other five received jail terms ranging from 21 months to eight years. However, all their sentences were reduced on a technicality last year by the High Court. Four of the leaders had already started serving their sentences and are currently in jail, while one woman has already served all seven months she was given.